A wise man once said "A new homeowner should never take down a fence until he first finds out why the previous owner put it up." That's a useful principle. 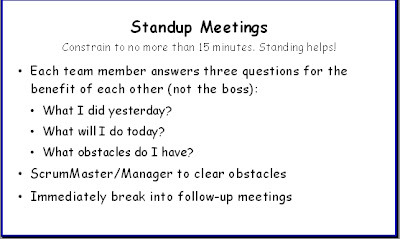 In your discussion of the standup "rules" I was reminded of this. One could decide NOT to follow the protocol and end up with a big time-waster. Or one could follow the rules until they become unnecessary because meetings are quick and informative. I prefer the latter. Kudos on recognizing that EDTOW (everyone does their own work) makes standups useless for the most part, and tedious at best. That is important to understand. We're talking circles around the concept of Shu Ha Ri here so I'm dropping in a link. interrupted their workflows). Because of this we developed a SaaS tool to ʺautomateʺ the daily standupmeetings - with just a single email. If you like to take a look: www.30secondsmail.com.